These sterling silver earrings are inspired by the Children of Lir Irish legend. These Children of Lir earrings have been hallmarked sterling silver by the Irish Assay Office at Dublin Castle. These engraved sterling silver earrings feature a swan from the Children of Lir Irish legend. The Children of Lir stud earrings measure 3/8" tall x 3/8" wide and have push on butterfly backs. 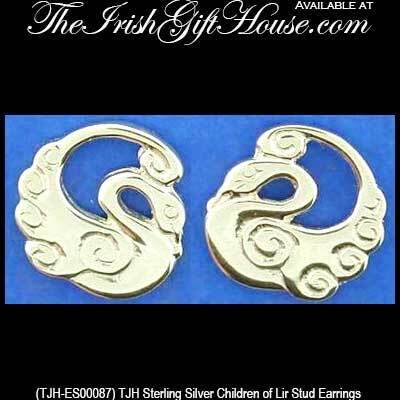 The sterling silver Children of Lir earrings are made by TJH in Dublin, Ireland and are gift boxed, complements of The Irish Gift House. The Children of Lir earrings are inspired by the famous Irish legend. Through a spell, the four children of King Lir, were transformed into white swans that possessed beautiful singing voices.